The scenery surrounding Boulder, Colorado creates some of the most picturesque landscapes west of the Rocky Mountains, projecting imagery that is mostly seen in oil canvas paintings. The captivating views will leave you breathless, more so than the altitude and thin air ever will. Amongst the rolling hills and lodge pole pines, lies a thriving site with spectacular views in almost every direction; a hidden deciduous oasis just outside the hustle and bustle of an active urban environment. 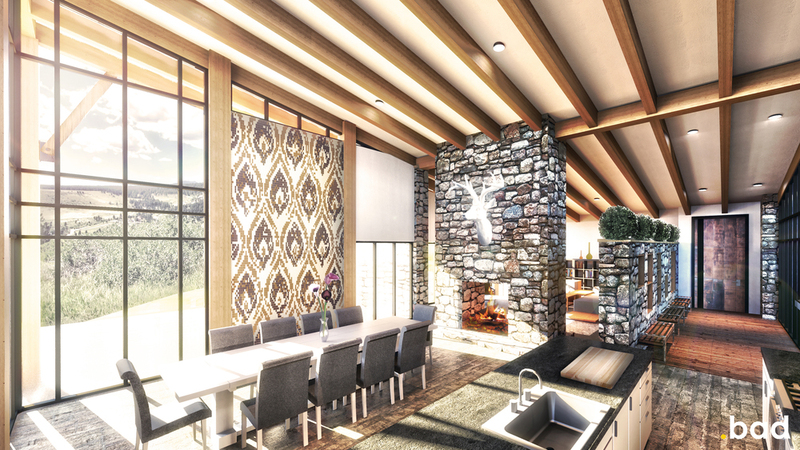 The proposed site on the hillside of the Boulder outskirts invokes a plethora of different design opportunities and challenges that make the building of this house truly unique. Taking cues from the steep topography, native vegetation, and rich vernacular of the area, we are able to seamlessly blend our contemporary design with the surrounding landscape creating a new architectural archetype within the community. Our proposal encompasses traditional Japanese architecture, arts and crafts style construction, and Adirondack style detailing, marrying each type into one cohesive form, and ultimately shaping our final decisions on the proposal. 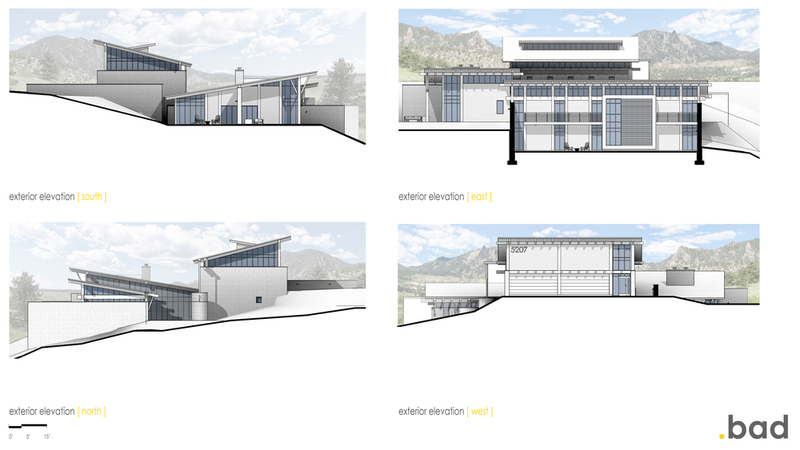 The building's simple forms are modeled after the local shed structures, incorporating the architectural styles of Japanese joinery and space planning. The house sits as two separate structures, (The Garage Suite & the Main Suite) that are only joined by the circulation through the site and the integration of the landscape itself. The forms of the two structures mirror each other as they cascade down the rocky hillside, pitching towards the differing mountain vistas. The garage suite projects upward and outward establishing a clear and defined entryway into the home, while the main suite matches the slope of the land, almost becoming one with the terrain as it lifts from the site facing the tree line of the land below. The house is supported by large stone walls which flank the outer edges of the structure and penetrate the walls of the home generating unique interactions between the occupants and the house itself. The strong use of local materials and topographic site work grounds the house onto this site merging it with the landscape. 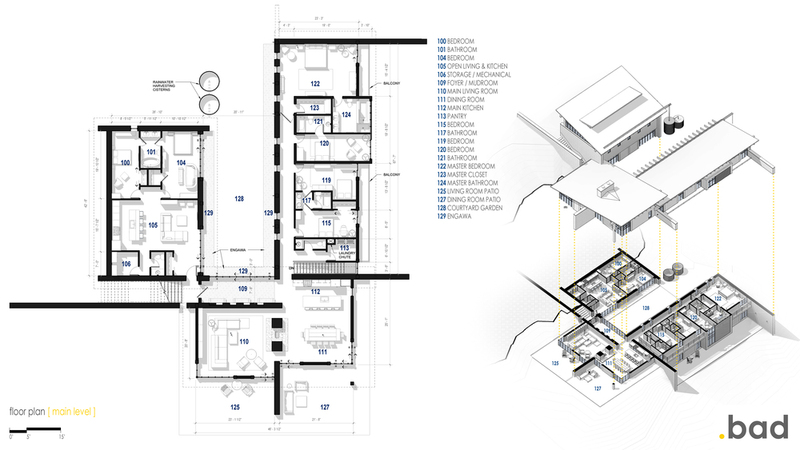 The house is laid out in a "U" shaped floor plan, made up of two living suites that are connected by the circulation through the spaces. 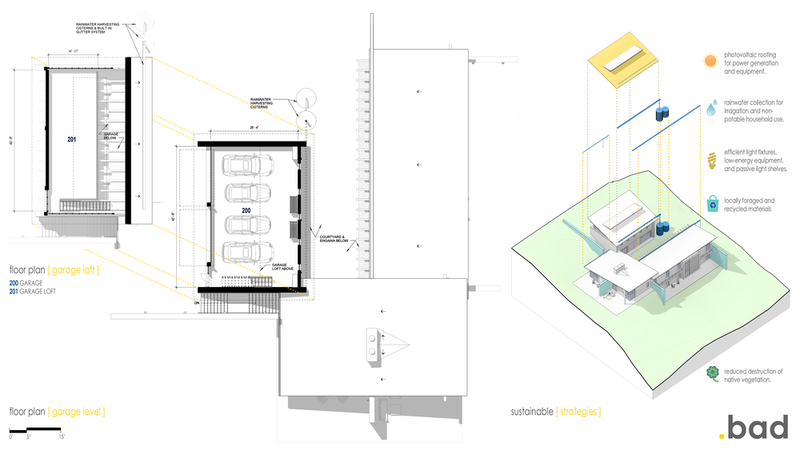 The garage suite resides at the northern point of the site, acting as the main threshold into the unit. It is meant to be used as a standalone apartment, fully equipped with two bedrooms, kitchen, open living space, and a beautiful loft that sits atop the garage, defining a work/study area under the tilted up construction of the shed roof. As one progresses down to the front door of the main house, you pass the fortified stone wall, engaging the land and the structure together. As you open the door, the threshold between exterior and interior is blurred by the engawa-like walkway that defines the mudroom and outdoor garden space separating the two suites. The mudroom opens into a large open concept floor plan, connecting the kitchen, dining, and living area, each with its own scenic focal points. 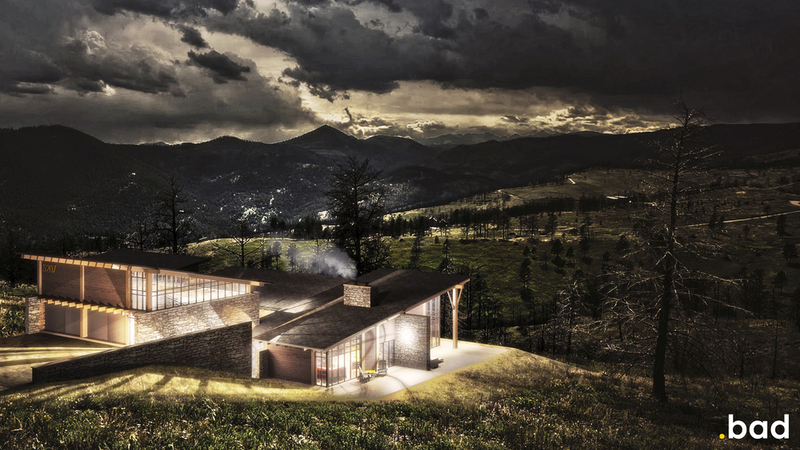 The three spaces are centralized around a large hearth, but are projected outwards toward the landscape. Each communal living spaces spills out onto patios surrounding the house, forcing an interaction with the earth. The master bedroom/bathroom and two guest bedrooms with en-suites complete out the rest of the ground floor. The bedrooms all have full access to a one story balcony that spills over the hillside, giving that breathtaking sensation once more. As we descend further into the spacious living quarters, we find yet another complete set of living quarters on the basement floor. A kitchenette installed for quick dining with friends, a large living room facing the rolling landscape for a peaceful view of the land, and a guest's master bedroom complete with their own master bathroom. The house was designed to optimize relaxation, so in order to reflect the tranquility of nature; a yoga studio was added to extend the occupant's emotions from mind, body and soul unto nature. The yoga studio is wrapped with a protruding yellow steel box, signifying the mind of the house, creating an architectural symbol within the body of the home. The design stands out as a contemporary conceptualization of the human body becoming one with the earth. The house's structures mimic the make-up of the human body, with skin, bones, circulation, and mind. Each one of these pieces acts together in unity to form one whole with the context of the landscape, producing one harmonized location. Finally, the materials were meticulously chosen to deliver a specific style and durability. 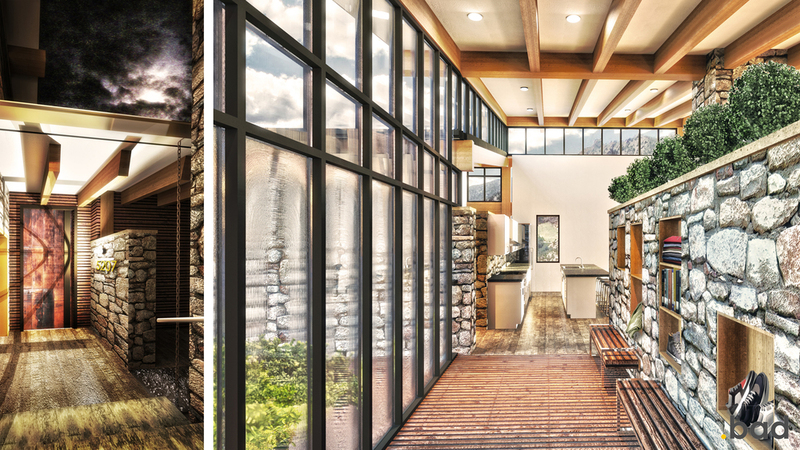 The locals areas mining and ranch buildings inspired the house’s exterior which consists of hand laid stone walls, natural wood structure, and patina-ed A606 steel, each with its own unique texture to match the earthy colors and natural surroundings. 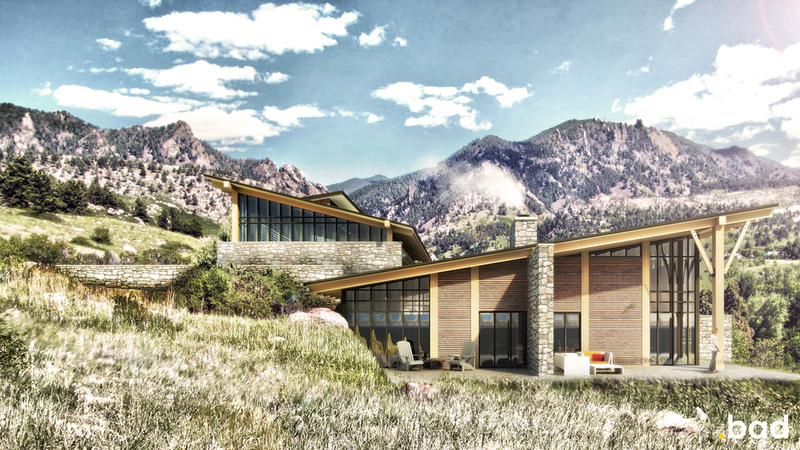 The large orange steel protrusion that juts from the front façade of the house, acts as a perfect mirror of the fall foliage colors that fill the Boulder landscape during the autumn months. Each one of these materials is fire rated and designed to be non-combustible, which is a high hazard during the hot summer months. Starting from the ground up, the house is constructed with a large, wrapping masonry and concrete patio which acts as a fire barrier, preventing the creep of a brush fire. The large stone and masonry bearing and retaining walls become passive fire barriers that block the spread of fire. The large heavy timber post and beam framing are treated to be highly fire resistive, compounding the effort put forth by the passive resistant stone bearing walls. The large Low-E, double-glazed glass windows and walls are installed with fire shutters as required, minimizing the effect of cracking due to heat. And finally the roof of the house is finished with structurally insulated panels with a Class A fire resistant slate tile finish. This roofing system will prevent any and all embers from sparking a fire that happen to reach the top of the structure during a wildfire. The entire structure works together to combat any danger a high hazard fire district entails.